Farro Tabbouleh with Kale is a hearty herbal salad that includes a combination of Italian parsley and fresh mint. The flavors are bold and satisfying. The farro adds a nice chew while the kale wilts under the acidity of the vinegar and fresh lemon juice. The Mediterranean salad tastes delicious fresh but it will keep for several days in the fridge. For this recipe, you will need Italian pearled farro, Tuscan kale, plum tomatoes, seedless cucumber, Italian parsley, green onions, mint, fresh lemon juice, balsamic vinegar, and extra-virgin olive oil, and kosher salt. 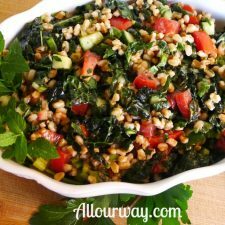 Sometimes we can’t leave well enough alone, like this Farro Tabbouleh Salad with Kale, Cucumber and Mint recipe. It all started when we saw the original recipe, Kale Tabbouleh with Cucumber, Garlic Scapes but immediately felt the need to modify. Do you ever do that? We do it all the time. This time, I suppose, one of the reasons was that we didn’t have a clue what garlic scapes were. First I went to my huge tome– The Oxford Companion to Food by Alan Davidson He wasn’t any help. Then I went to our in-house expert, Mr. Google, and soon found out that I probably wouldn’t be able to run over to our local grocery store and just grab garlic scapes out of the case. 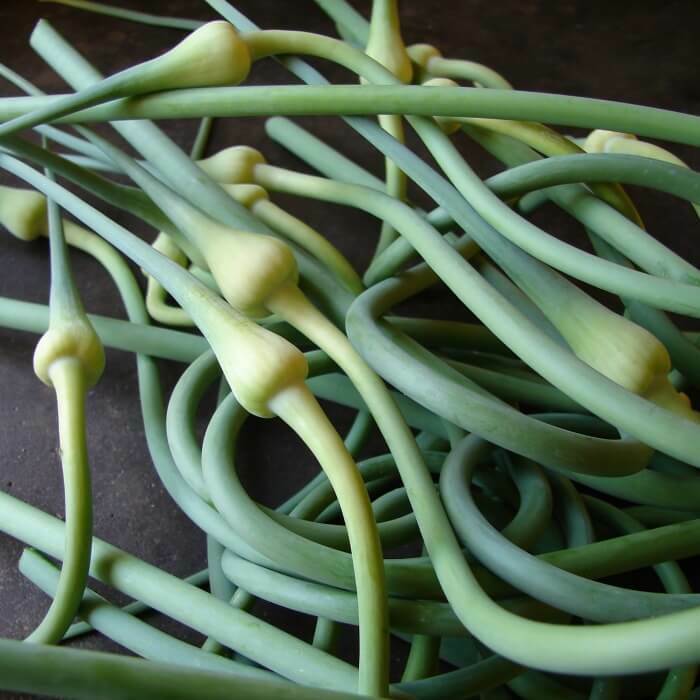 You see, garlic scapes are the “flower stalks” of the hardneck garlic plants. And I also found out that the stalks do not produce flowers. Blah…blah…blah…there was quite a bit of detail. I figured this was information was something I was never going to need. What information I did need was that I had to get a substitute because there were no garlic scapes to be had. So it was time to formulate plan “B”. They’re green like garlic scapes and mild. They’re an aromatic —bingo. Problem solved! But as I continued to read the recipe I discovered something else as I read over the recipe. The recipe called for bulgar. Authentic tabbouleh has bulgar in it. Unfortunately, our kitchen didn’t have bulghur in inventory. Hmmmmm!! 🤔 This would take a plan “C”. We like farro. We like its chewiness. It’s Mediterranean and that’s close enough to bulgar country, right? We had the rest of the ingredients for our farro tabbouleh salad– cucumbers, mint, Italian parsley, and lemons. 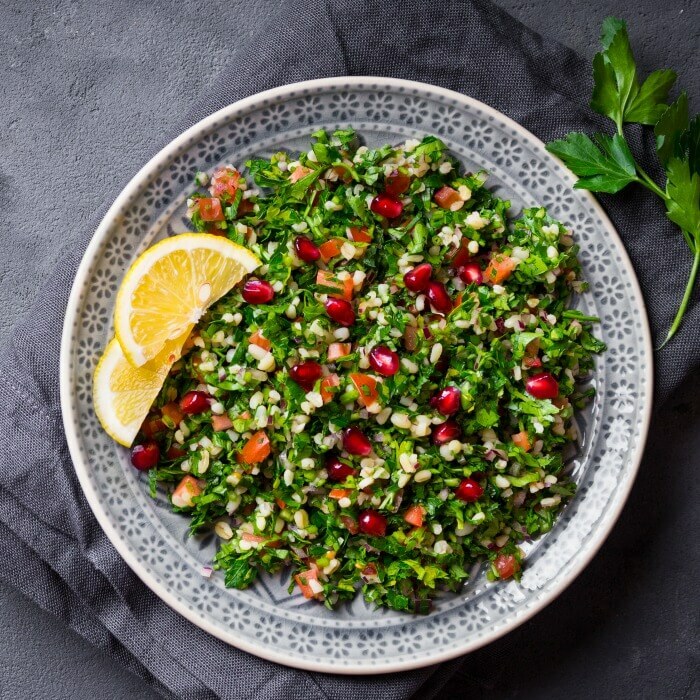 Tabbouleh is really a parsley salad with a little bit of bulgar used more as a garnish. It also has a touch of cinnamon, this is according to the food/blog expert David Lebovitz. Mint with a ratio of about one part to four parts of parsley. Everything should be chopped very small. Sweet spices which can be allspice, cinnamon, nutmeg, coriander, clove, and ginger. 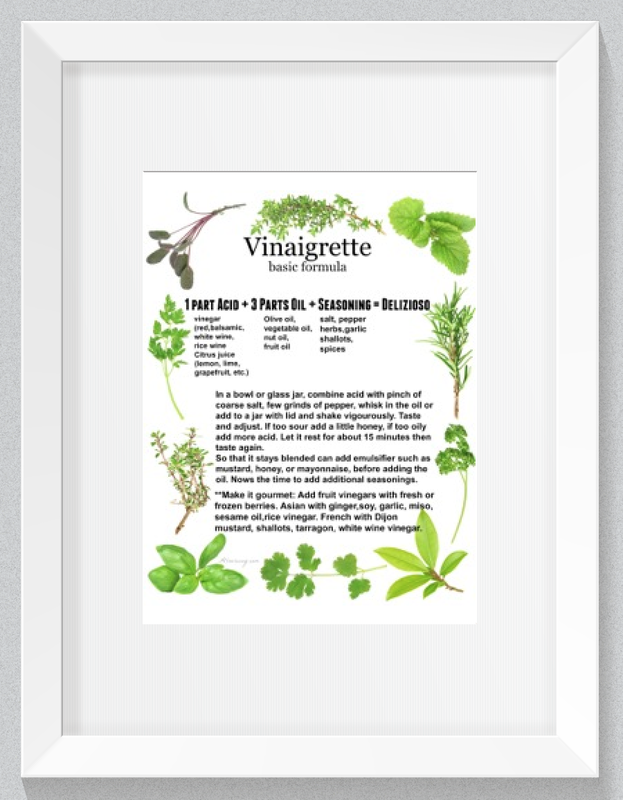 There is a Lebanese seven spice blend that is commonly used. Well, it seemed like this Farro Tabbouleh was just going to be made All Our Way. And as it turned out it was quite a tasty salad. The females in our family enjoyed it. Now the males in this family are carnivores. So, if a dish doesn’t have meat in it or next to it or on top of it. Well, it just isn’t a favorite but as a side they really liked it. I know you’ll enjoy the flavors of this vegetable combination. It isn’t heavy on the parsley so it doesn’t overwhelm the salad. I’m glad we ended up with plan “C”. This recipe is a keeper. 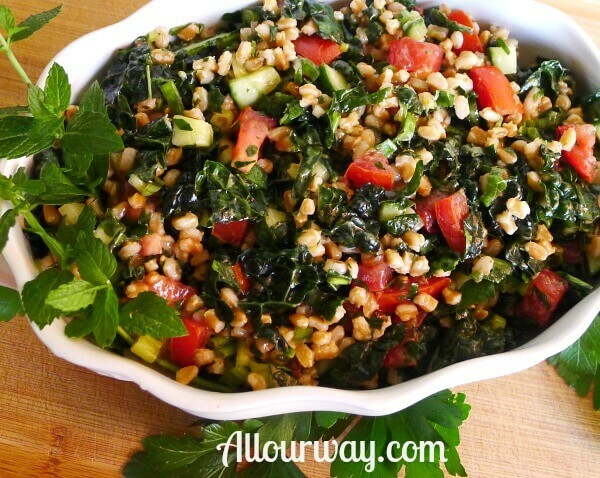 Is a green herbal salad with farro adding chewy texture to the greens. It has a bold flavor with a touch of spice. Typical tabbouleh is best the same day but this salad tastes fresh even several days later. In a small jar, combine olive oil, lemon juice, balsamic and salt. Cover and shake to combine. Place the farro in a saucepan with the 2 3/4 cups water, bring to a boil and simmer until the farro absorbs the water. Cool completely. Cooking directions may vary with the brand so follow the package directions. Finely chop kale and parsley. Toss with 1 tablespoon of lemon dressing and massage for a minute or so. Leave to wilt slightly while you prep the remaining vegetables. Dice tomatoes and cucumbers. Chop the green onions. Toss the vegetables on top of the massaged kale. Add cooled farro to vegetables and combine with remaining dressing. Toss everything well. Finely chop mint and add to the salad. Taste the salad and add more salt if needed. You can serve this at once or refrigerate for up to 2 days. Other recipes you may like . . . Note: Recipes and content from All Our Way ©2014 are copyright protected. Please do not use content or recipe without prior written permission. If you want to share the information please link to this post. Thank you. Great ingredients, put together in a lovely and delicious way. Improvise – I love it! It’s always good to try out variations with what you have on hand – if nothing else it teaches you more about what you can do with ingredients that you might already know and love. I’m surprised that Davidson had nothing on garlic scapes – I always feel like that book has covered everything! But then I guess that’s one of the great things about food – there’s always something else to learn about! 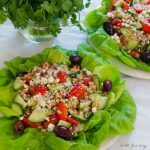 I love traditional tabbouleh and I think I’d equally love this farro tabbouleh… In my opinion, everything is better with kale, so I absolutely love that addition! 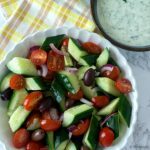 This is such a refreshing and nourishing salad! After holiday indulgences on the weekend, I’m always hankering something light and fresh throughout the week. Gotta hit that reset button! And this is the perfect thing. The mint really makes a difference! Lovely recipe…perfect for winter! I have never used garlic scapes and just added them to our garden list for next year. I have, however, enjoyed plenty of farro, and need to stock it in my pantry. I get on farro kicks sometimes, and this is the perfect recipe for doing just that. Thanks for sharing! Same thing happens to me all the time…I read a recipe and want to make it right away…which means I have to improvise with what I have on hand. Good job with the subs. I’m particularly fond of faro. I love the nubby texture. This recipe is so wholesome and fresh. Thank you. I’ve heard of Tabbouleh but never tried it. This sounds absolutely delicious. I’ll also admit that I never have used garlic scrapes before. Thanks for the alternative of green onions – definitely an ingredient I’m more familiar with. This was sooooo good!! 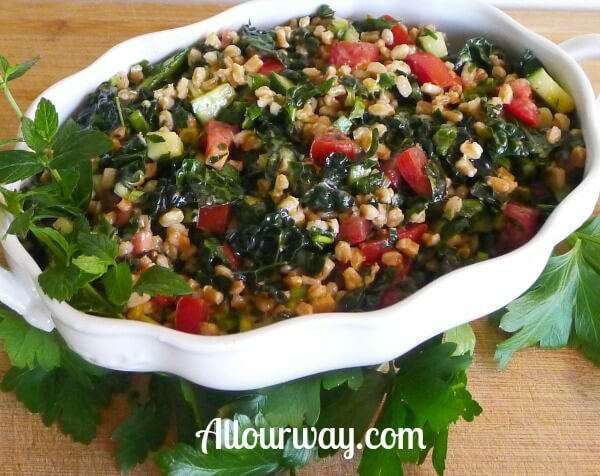 I love the farro instead of bulgar wheat and the addition of the kale is wonderful. Another great recipe here, thank you so much! We’re adding it to our staple sides! Garlic scapes are one of my new favorites! I started getting them in my CSA box last year and am always looking for new ways to use them (although, when I first got them I was a bit like you, “What the heck?”). I also love this alternative to traditional tabbouleh. The additional texture of the farro really mixes it up. Plus, the balsamic really gives it a unique twist. Such a fun recipe! I can’t tell you the number of times I set out to make one thing and ended up with something slightly different to adjust for ingredients we had “on hand” instead of what was called for. 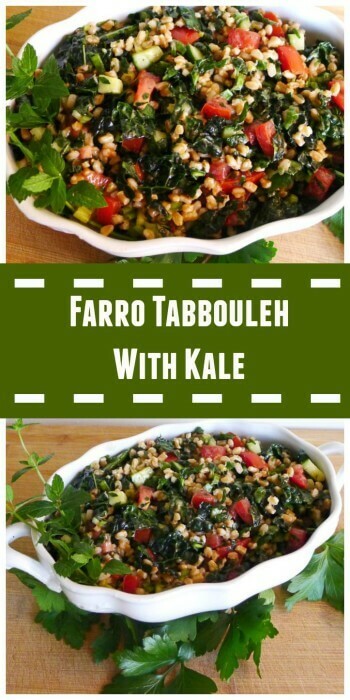 I agree that farro is an excellent substitute for bulgur wheat and I’m also really liking the kale in this tabbouleh. This would be a perfect lunch to pack for work. Healthy, delicious and filling! Yes, unfortunately, garlic scapes are so seasonal. In fact, they are only available a few short weeks a year. Love the sound of this salad. I have not used farro in a salad before. Sounds hearty and delicious. I will try it with my roasted garlic scape recipe. Farro is so versatile and easy to prepare and the way you’ve layered the flavors with the balsamic and lemon on top of the kale sounds wonderful! This recipe is a must try for me! 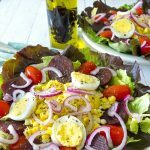 Two of my favorite ingredients in one salad – brilliant! Such a great adaptation of the classic with a bit more heft and perfect for fall and winter!! Thank you, Nancy! We do like our farro and kale. I’ve made it quite a few times — I prefer farro to rice. Ooooo! This sounds wonderful! Can’t wait to try it! I saw a recipe this spring for “garlic scape pesto”. I had the same reaction you did—–what the heck is a garlic scape—I, too, googled it. So now that I knew what a garlic scape was, how do I find it. Of course none of the grocery stores had any. Neither did the produce shops in this area. I finally found garlic scapes at my local farmers market, from a farmer who farms organically. I made the garlic scape pesto, and it was really good!! Brought some to the farmer who sold them to me. Now I’ll have two recipes using garlic scapes! I’m glad you now have another recipe. I love trying different tastes and recipes and such. Our farmers market here is fairly large — next time I go I’ll have to try and pick up some garlic scapes. This recipe originally came from a chef/blogger from Canada. If you try it with the scapes let me know how you like it.